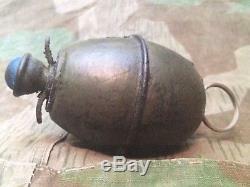 THIS ITEM IS AN ORIGINAL AUTHENTIC SCREEN-USED PROP GERMAN GRENADE FROM THE. ALL-TIME WORLD WAR II FILM CLASSIC "SAVING PRIVATE RYAN", STARRING AMERICA'S MOST BELOVED ACTOR TOM HANKS & DIRECTED BY AMERICA'S GREATEST DIRECTOR STEVEN SPIELBERG!!!!! 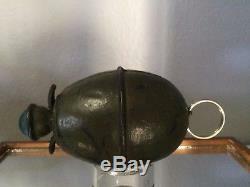 M39 "EGG" GRENADE IS MADE OF FOAM RUBBER & MEASURES 5 IN LENGTH. ACCOMPANIED BY A FULL PAGE COA FROM "AT THE FRONT" AND COMES WITH OUR LIFETIME GUARANTEE! PLEASE VIEW OUR PHOTO GALLERY. THANK YOU FOR SHOPPING WITH US! 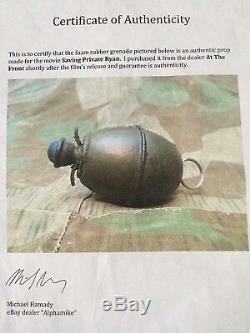 SCREEN-USED SAVING PRIVATE RYAN/HANKS PROP GERMAN M39 EGG GRENADE" is in sale since Wednesday, July 11, 2018. This item is in the category "Entertainment Memorabilia\Movie Memorabilia\Props\Originals". The seller is "iwouldbuythat" and is located in LONG ISLAND, New York. This item can be shipped to United States.